Is that a yoga mat on your back? Going fly fishing? Nope--it's a cleverly concealed, portable party cooler! Is that a yoga mat on your back? Going fly fishing? Nope--it's a cleverly concealed, portable party cooler! This insulated hemp sling pack holds a cold six pack of your favorite beverage for a backcountry adventure or trip to the park. 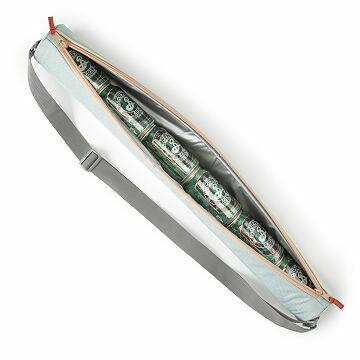 The full length zippered pouch is ideal for toting standard cans or tallboys, the adjustable shoulder strap ensures comfortable carrying, and the waterproof, seam-sealed lining contains any condensation or spills. Made in China. Can hold six 12 fl. oz. cans of frosty beverage. I can't wait until my father start using this to store his drinks he have between his golf game. This very uncommon drink cooler will be very handy and will be a great conversation piece. I was very pleased with the quality of the cooler. Well made, useful, funny... everything I hoped! Fun gift for friend, but with confidence. You can sling it across your back leaving both hands free. You can unzip it from either end so it's easy to replace full can at top with empty can at bottom, or vice versa. So much better than your normal heavy cooler, especially for hiking - leave no empty behind. Thanks for always providing great customer service and products! My dad got so many compliments on this! Everyone wanted to know where he got it! This is the perfect gift for someone who goes to concerts, picnics or the beach.